Moon Wheel’s mellowed Kosmische laboratory research was originally conducted with the dream of cell-welding the loose, lunar lunacy of Moondog with Clara Mondshine’s planetary rhythm trances (particularly “Die Drachentrommler” – played at 33, not 45, of course) but a relocation to Berlin steered the project in a starker, more technological direction. After years spent in Melbourne and a stint in a remote Swedish lodge, Herr M. Wheel aka Olle Holmberg finally consolidated hours of fractured workshop compositions into the eight uncanny absorptions composing this self-titled debut. Opening with the stark, mad scientist synth throbs of “Elbsandsteingebirge,” the tape unfolds through weirdo dubby groove deconstructions (“ÁlæifR”), Agitation Free-style exotic bazaar jazz/jam fusions (“Arecaceae”), and even one FX-haunted sci-fi guitar raga (“Valhöll”) before ebbing into the more mechanized, dry ice formalities of the Berlin-birthed B side. The eerie, industrial skeletons of “Brontide” and “The Weather” conjure an unsettling, melancholy, ghosts-in-the-machine mood, the sound of derelict robotics factories whispering code in the dead of night. A subtle, captivating collection by an impressively unpredictable producer with ideas to spare. 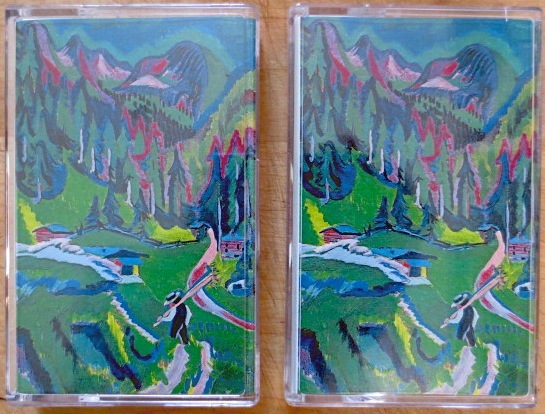 Pro-dubbed cassettes in Yoga Records-inspired 3-panel full-color J-cards designed by Holmberg, with a cover painting by Die Brücke avant-gardist Ernst Kirchner. Edition of 100.